07 | December | 2014 | Troy C. Wagstaff aka CallahanWriter Blog: Topics of interest include Western Historical (1865-1899) Topics. Additionally inspirational Christian and Fibromyalgia interests. Throughout the Holy Scriptures water is symbolic. The symbolism of water depends on the parable and how it is used. Water can be symbolic for healing, life, blood, cleaning, Word of God or the gospel. In this instance the symbolism of water deals primarily with the symbolism of life and healing. This imagery comes from Ezekiel 47. In Ezekiel 43-47 an Angel is showing Ezekiel the plans for a temple or sanctuary for the Lord. The exciting part of this story culminates in chapter 47 where there is a building and from the building issues forth a River. The river measures about one thousand cubits and it flows through the wilderness or desert and then into the Dead Sea healing everything it touches. The width of the river measures one thousand cubits wide. According to the Hebrews a cubit is a measurement from the tip of the elbow to the tip of the middle finger. Throughout the history of the ancient Hebrews a cubit could be 17.5 inches or 21.5 inches in length. If we were to consider a cubit to be 17 ½ inches, then one thousand cubits equal 486.1 yards. That means that the width of the river would be four football field lengths plus 86 yards. If we were to use the 21 ½ inch cubits then the width of the river would be 597.2 yards, or essentially the length of six football fields. Mathematically we can say that the river that flowed from the sacred building through the desert to the Dead Sea was five to six football fields wide. We don’t know how long the river was and it doesn’t matter. What really matter is what the river symbolizes and how that applies to our lives. I believe to get the full measure of what the Bible has to teach us we need to liken each verse to ourselves and to our everyday life. Insert your name when applicable into verses and passages of Scripture so that it looks like it was referring to you. Apply the lessons of those passages to your daily life. To apply the passage of Scripture found in Ezekiel 47 we need to understand the symbolism of the building, the wilderness, the Dead Sea and the river of water that comes from the building as it goes through the wilderness and into the Dead Sea. The building, is the source of the river of water. The sanctuary could represent the Scriptures, the gospel of Jesus Christ, a temple or prophet etc. The wilderness or the desert represents our lives and the lives of those around us. The Dead Sea is also symbolic of our lives before the healing gospel message is internalized by us. In the Scriptures, the water issues forth from the temple going through the wilderness and into the Dead Sea. The angel takes Ezekiel to the river and he walks across the river and it goes up to his ankles. 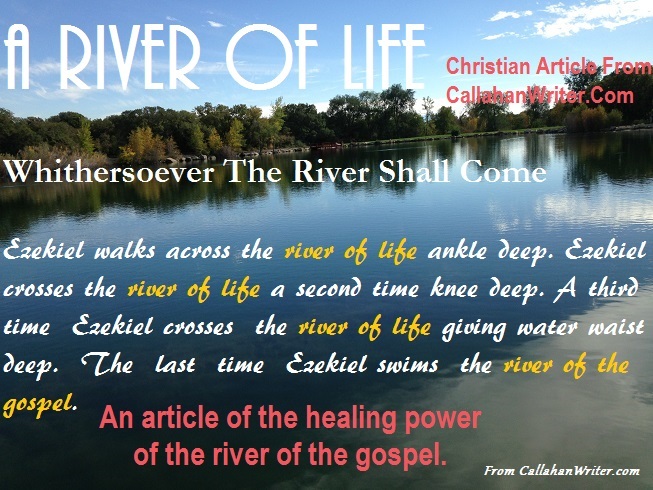 A second time Ezekiel crosses the river and it goes up to his knees. A third time Ezekiel crosses the river and it goes up to his waist. The last time Ezekiel goes to the river, the river is so deep that Ezekiel cannot cross the river unless he swims. When you apply water to soil, you can go from a barren ground to a fertile land teaming with all types of plant life. From the plant life comes animal life. Ezekiel goes back to the bank of this very wide river and sees on both banks of the river a multitude of trees and vegetation. He notices fish living in the healed waters. He notes that these trees have fruit for eating and leaves for medicine. Everything needed to sustain life. The “river of life” mentioned in this biblical metaphor creates life-sustaining substance from something that is barren. Compare this to our life. Our lives are spiritually barren until the river of life flows through the barren spirit of our life. If we let the river of the gospel flow through our lives at ankle depth then great things can happen to a barren soul. If we let the river of life flow through our soul at knee depth, we are blessed even more. The spiritual sides of our lives are transformed. Out of darkness our spirits are filled with the bright light of the gospel. If we let the river of life flow through us up to our waste, as it were, we notice even greater spiritual life welling up within us. As the river of life that flows through us gets so deep we have to swim then we notice that God is making more of us than we can ever make of ourselves. All we ever had to do was open the floodgate and let the water in. If we find ourselves swimming in the healing river of the gospel of Jesus Christ, completely submerged in these life-giving waters, we can find ourselves made whole in many different ways. If we have sinned, we can open the floodgate through repentance and be made whole again. If we are suffering trouble through no fault of our own, we can open the floodgate to the healing waters of Jesus Christ. If we need strength for the trials’ we face, we can open the floodgate of the river of life to give us strength for the burdens we face. For all of these blessings, all we have to do is open the floodgate and let the waters flow freely through our life. Think how wonderful this is, that we can be healed by the rivers of life. Consider another point, not only can we be healed, we can become fruitful with all kinds of trees, vegetation and fish growing and developing within us. This is symbolic of our growing spirituality to becoming a source of spiritual strength and nourishment to others.